Carnaby Street was at the heart of Swinging London in the 60s. John Stephen's famous men's shop on Carnaby Street was a Mecca for the London mods. The whole street was the place to shop for the young and trendy, as satirised in the Kinks' "Dedicated Follower of Fashion". John Stephen opened his first shop "His Clothes" in Beak Street just off Carnaby Street in 1957. In those days, Carnaby Street was far from a fashion centre. An electricity substation occupied one side of the street and the only shop of interest was Inderwick's, a historic pipe maker and tobacco blender dating back to 1797. John Stephen moved "His Clothes" to Carnaby Street in the late 50s, after a fire at his original shop. Interest in Stephen's clothes spread quickly. He soon had a chain of shops all over London. Carnaby Street became the centre of male fashion. Carnaby Street's time as a fashion centre was limited. The Jam were less than impressed with the Carnaby Street of the late 70s. They sang "Carnaby Street, not what it used to be". These days Carnaby Street is something of a tourist attraction. However, it is still a great place to shop for mod gear. John Stephen's shop has gone, but there are several other shops taking inspiration from the spirit of the 60s. Sherry's is at 24 Ganton Street, which is just off Carnaby Street. 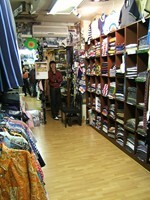 The shop was established in 1979 at the time of the first mod revival. It was named after the owner's daughter. With its mauve colour scheme and mod logo, Sherry's has much more of an authentic feel than some of the larger chains on Carnaby Street itself. Inside, Sherry's is a small shop, packed with merchandise. The eye is drawn to shirts, suits and badges. The stock is extensive. 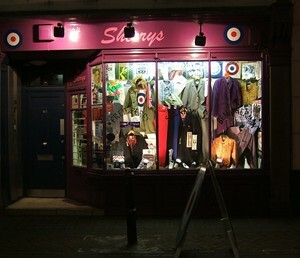 Everything from a sixties' style Tonic suit to a T-shirt can be bought at Sherry's. There are some great exclusive design paisley shirts, as well as a huge range of Ben Sherman, Fred Perry and John Smedley. 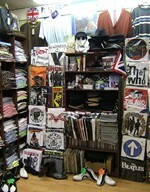 The walls are lined with posters and memorabilia from the mod era, the sixties, the late seventies and from today. Sherry's is definitely the real thing. They recently kitted out the newly reformed mod band, The Jam. Another shop selling mod gear on Carnaby Street is Merc. 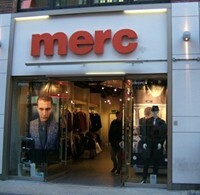 Established in 1967, Merc have their own label clothing and a wide range of mod gear. When we visited they had a fantastic paisley suit in stock. Update: Unfortunately the shop is no longer on Carnaby Street, but you can still shop online. The original Ben Sherman label is now a national chain. Their shop on Carnaby Street is fantastic. You can get a far better selection here than in any of the department stores. The emphasis in this shop is very much on the mod look. 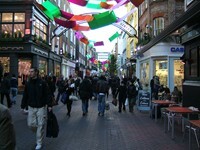 For more information on Carnaby Street see www.carnaby.co.uk.